We all know that pace is an important part of squash. If you hit the ball consistently hard it will move faster and get by your opponent faster. It's also just fun when you crush a ball and the sound it makes off the front wall. When you're in the back of the court hitting with pace can help ensure your opponent cannot volley your length. When you're in the front, hitting with pace can again keep your opponent from cutting off your shot. Not only can pace make it harder for your opponent to volley, it can also make the ball bouncier which many people struggle with. As the ball heats up many of us have more difficulty controlling the ball and can't bring the ball short well. Back at university I played a boy who later went on to win the CSA Individuals and he hit the ball so hard and the ball got so warm that I struggled to hit a regular serve. 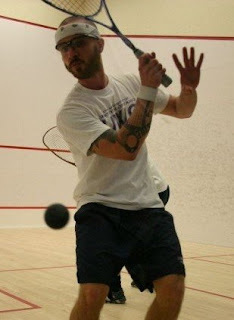 It was to this day the bounciest ball I've ever had to use in match and it felt like I was playing a game of racquetball. He of course was used to this pace of the ball and the bounce and was much better equipped of controlling it. If you've ever experienced something like this you know that nothing else really matters if the pace 1 player is playing at is much higher than the other person can handle or is used to. The big question here is do you need to be able to play pace or simply handle pace? Handling pace is perhaps more important than being able to apply pace yourself. I've seen many times where someone plays at such a high pace they eventually tire themselves out as their opponent just continues to chip the ball and waits for the right time to deliver the knockout blow. See it can be quite tiring to constantly be hitting the ball hard. Just hitting the ball hard in itself is not enough of a weapon if you are playing someone who moves well and can handle/control the pace you are hitting with. If you however play a very slow pace you will find it difficult to apply consistent pressure on someone. When you get your opponent out of position you will have trouble hitting say a low hard attacking drive before your opponent can catch up to the ball. So yes, even if your opponent can play at a higher pace than you, you still have to be able to inject pace at the right times. Again, back at university I remember hitting with an alumni who was still quite a strong player. Back at this time I didn't get a lot of feedback on my game so I was happy to receive some from him. He told me I could do everything well, but I needed to be able to play with more pace. I'm not a big guy, about 150lbs and 5 '7. So before I did lots of solo hitting I had trouble playing against bigger and stronger men. I also remember a good drill I was told to practice to improve my pace. I was told at the end of every practice to play a game or 5 minutes of rallies where I just try to hit every ball as hard as I can. Obviously there are times where I'd be late to a shot and I couldn't' hit it very hard, but the idea is to learn how much physical and mental energy and effort it takes to play a high pace. If you are going to try this I recommend you don't swing hard when the ball is tight to the sidewall and you also need to have reasonably sound biomechanics or you could injure yourself. So what other tricks are there for learning to generate more pace? I don't have a long lever (arm) or a lot of mass to put into my shot, but I can hit the ball with a good amount of pace pretty consistently these days. A lot of solo drills helped me a lot. I really liked midcourt short hitting drills which helped strengthen my forearm and groove my swing. Hitting with pace also has a lot to do with timing. You can have a great swing, but if your footwork is off or you can't lunge properly you are going to have trouble playing at pace within a rally. Pace really starts from the ground up. You need to have a solid base of support and if possible being able to transfer your weight from your back hip to front hip is really key. Also learning to rotate your shoulders to connect your core makes a big difference too. When you do this it makes your backswing bigger and it engages your larger muscles. When most people try and hit the ball with more pace they use their arm to swing harder and their arm gets straighter or further from their body. But really it's about weight transfer and rotational core strength. When you link these things together into the swing it becomes part of a biomechanical link which allows small people to hit the ball hard. Here's a clip from the Serious Squash Youtube channel demonstrating the weight transfer from back to front hip. Notice the solid foundation/base of support. If you are simply trying to get adjusted to handling pace and less interested in hitting with more pace you could also try and practice with a bouncer ball (red or blue dot). Doing this will allow you to learn how to control a bouncier ball. You will need to cut your drop shots more and the ball will be higher when you strike it. Some other tips for increasing your pace: try looser strings. Some strings also are more springy and produce more natural power. Improving your rotational core strength and range of motion. Footwork to get behind the ball. Working on your lunging and squatting will help you get lower and stay balanced when you hit the ball hard even if it's low or you're slightly late to the ball. If you're not athletic and you haven't been doing any strength training you won't be able to play pace under any bit of pressure in a match. Play around weight and balance of the racquet and find which gives you more pace. Hitting a LOT of balls/solo: the more you hit the more you will improve your timing. Do some feeding drills or finish with a condition game like I mentioned above where injecting pace is the priority. Rotate your shoulders, but your racquet shoulder should lower under your chin (your shoulders don't rotate parallel to the floor). You can also play around with the angle of the racquet face; slightly closing it will allow you to hit it harder as spin from an open racquet face takes pace off of the ball. When people first start learning to ski they are taught how to fall so they are not scared of this happening and injuring themselves. When I thought about this I started comparing it to squash and learning how to fail, or lose. See for some reasons we've come to think of losing a competition as a form of failure. Almost all of us have stepped out on the court often and played trying to lose than playing to win. We worry abut who we are playing and what the result should be. It's no wonder we normally play our best squash when we are up against a stronger opponent where we don't have any pressure and they do. I know a loss in a big tournament has bugged me for a year or more. I now try and give a short window(5 minutes) after to learn from the match and then completely move on. Unless you've filmed the match or are going to discuss it later with your coach it's best to let a loss or win go as soon as possible. A squash match isn't like a test in school or any other test for that matter. If you prepare properly you generally know you are going to be successful, but in a squash match only 1 player is going to be the winner on that given day. Failure isn't something anyone enjoys and generally makes us want to train harder so we can succeed next time. But once again this doesn't mean that success is a given. If you prepare to the best of your ability I believe it can take off a lot of pressure and improve your confidence heading into a match, which are both very important to improving your likely of being successful, but it doesn't guarantee success. In fact, nothing guarantees success in sport, that's why we play the game. One of the hardest things to teach a kid is to give everything they have to try and win, and even a little bit more, but that it is still okay if they do not. This is why as coaches we talk about process goals so often. When we set goals based solely on outcomes they are in many ways out of our control. This again makes me wonder if it's possible to redefine success from your matches so that you are always successful? Obviously if we break success down into some controllable categories it can be. I like to focus on the preparation leading up to the event/match, the effort and competitive level and if the athlete was able to experience the zone. Experiencing flow show a level of focus and being able to calm ones nerves, shake off bad moments which is essential to playing at a high consistent level of squash. We could also talk about tactics, but nobody gets tactics completely right all the time. But if we focus on playing the right shot we will help our long term development most. Many people think that playing the shot that they are most comfortable with and will mess up less is smartest, especially in the big points, but this is also going to limit your growth and development in the long run. If you continue messing up on the right shot over and over in a match, at some point you need to put it on the back burner and work on it more in practice, but to never play the shots you're working on until they're perfected shows you are again focusing solely on the result and not the better picture. So when we look at measuring success on this level, someone could win a match, but not be successful. It's really all a matter of how we define success.